In addition to learning about news release preferences in our recent survey of over 200 journalists, we also wanted to learn about their online practices. As news creation and consumption has shifted online, journalists research habits are changing and we wanted to learn how. To start, we asked them how they research story ideas. Not surprisingly, we found that research happens online. 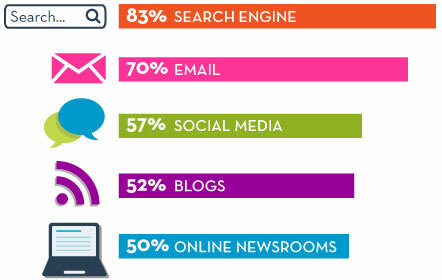 Search tops the list with 83% of our respondents confirming they use search engines when researching a story or article. But given their preference for email, it’s also not surprising that their own inbox is also a valuable resource with 70% reporting they use emailed releases for research. Social Media (57%) Blogs (52%) and online newsrooms (50%) were also cited as useful. But in today’s digital world, online means mobile. And indeed, journalists are researching story ideas on screens of all sizes, although traditional computers still outrank small screens: 99% said they used a desktop of laptop while 37% said they also work on smartphones and 26% said they use tablets as well. shared some details on what social media elements they want in releases, but this month we wanted to highlight social sites used for research. 85% percent of our respondents told us they had used Facebook for research. Twitter came in second, with 67%, followed by LinkedIn (45%, Google+ (39%) and Instagram (26%). CHECK OUT PWR’s 2016 JOURNALIST SURVEY HERE.